Only 132,416 Miles! Scores 26 Highway MPG and 19 City MPG! This Buick Rendezvous delivers a Gas V6 3.4L/204 engine powering this Automatic transmission. WHEELS, 17 (43.2 CM) STEEL (STD), TRIBECA/HOCKNEY CLOTH (STD), TRANSMISSION, 4-SPEED AUTOMATIC, ELECTRONICALLY CONTROLLED WITH OVERDRIVE (STD). 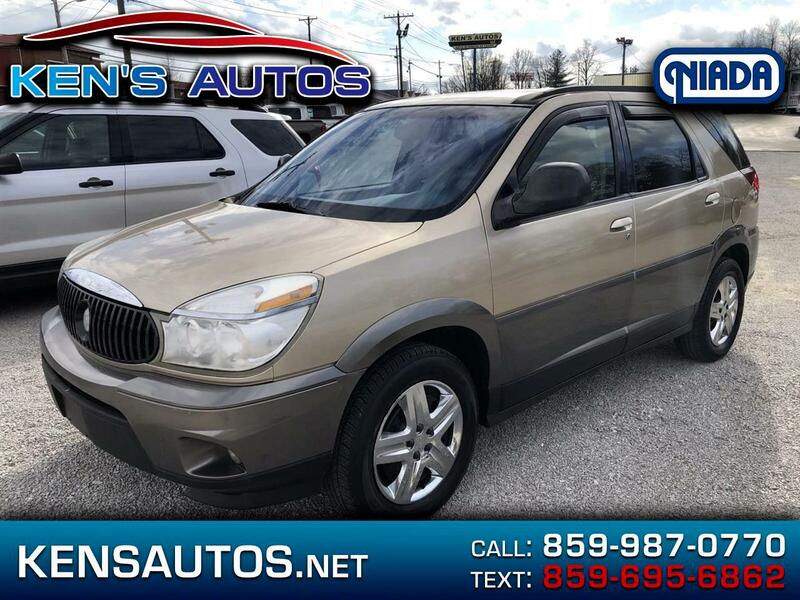 *This Buick Rendezvous Comes Equipped with These Options *TIRES, P225/60R17, ALL-SEASON, BLACKWALL (STD), SOUND SYSTEM, ETR AM/FM STEREO WITH CD PLAYER, includes Radio Data System (RDS), seek-and-scan, digital clock, auto-tone control, speed-compensated volume, TheftLock, programmable equalizer and 6-speakers (STD), SEATS, includes head restraint, 1st row manual lumbar support, manual reclines, 2nd row flip/fold, removable bench with fore and aft controls (STD), SEAT ADJUSTER, POWER, DRIVER 6-WAY, PAINT, SOLID (STD), ENGINE, 3.4L 3400 V6 SFI (185 HP [138.0 kW] @ 5200 rpm, 210 lb.-ft. [283.5 N-m] @ 4000 rpm) (STD), CX PREFERRED EQUIPMENT GROUP, includes standard equipment, Windows, rear, dark tint, Windows, power, includes driver express-down, Wheels, 17 (43.2 cm) steel. * Stop By Today *Test drive this must-see, must-drive, must-own beauty today at Kens Autos, 1801 Main Street, Paris, KY 40361.